How are Sites Added to the List? Represents a masterpiece of human creative genius and cultural significance. Exhibits an important interchange of human values, over a span of time, or within a cultural area of the world, on developments in architecture or technology, monumental arts, town-planning, or landscape design. Is an outstanding example of a type of building, architectural, or technological ensemble or landscape which illustrates a significant stage in human history. Is an outstanding example of a traditional human settlement, land-use, or sea-use which is representative of a culture, or human interaction with the environment especially when it has become vulnerable under the impact of irreversible change. Is directly or tangibly associated with events or living traditions, with ideas, or with beliefs, with artistic and literary works of outstanding universal significance. Contains superlative natural phenomena or areas of exceptional beauty and aesthetic importance. Is an outstanding example representing major stages of Earth’s history, including the record of life, significant ongoing geological processes in the development of landforms, or significant geomorphic or physiographic features. Is an outstanding example representing significant ongoing ecological and biological processes in the evolution and development of terrestrial, freshwater, coastal and marine ecosystems, and communities of plants and animals. Contains the most important and significant natural habitats for in-situ conservation of biological diversity, including those containing threatened species of outstanding universal value from the point of view of science or conservation. Press and Popularity. The first benefit, however, is all about tourism. Once a site has been recognized, it becomes more attractive to travelers and therefore travel writers and other news organizations will help spread the word. The site suddenly has a certain status that it didn’t have before, and for many countries, this could help bring new economic benefits. Funding. The site is eligible to receive funds for its protection and conservation. Since it is declared something of historical significance, it is understood worldwide that it needs to be preserved. The site will also have access to global project management resources if a repair is needed or if more options for tourism is needed to ensure the site’s protection. Protection during a war. Once declared, the site becomes protected under Geneva convention against destruction during a war. Today, some of the most recognized UNESCO world heritage sites including Serengeti National Park, Machu Picchu, and the Taj Mahal. Again, each world heritage site receives not only recognition, but protection from encroaching industrialization, mistreatment, or misuse. World heritage sites are not permitted to be used in support of military efforts and are to be an inspiring example of how recognizing the importance of art, cultural heritage, and natural beauty can transcend borders and political differences. 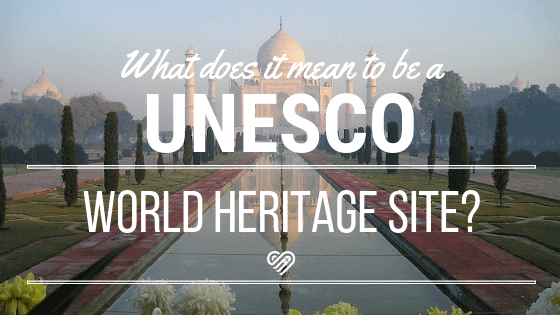 Which UNESCO World Heritage Site has been your favorite? Which site is on your bucket list? Let us know your story and your thoughts in the comment section below!